This article contains spoilers for this weekend’s Oz the Great and Powerful. Early reports suggest that Sam Raimi‘s Oz the Great and Powerful is on its way to becoming a massive hit, taking in $2 million in midnight screenings and moving like a tornado towards a predicted $80 million weekend. Even before the dollar figures became apparent, Disney knew they had a hit on their hands — at least, enough to begin developing a sequel to the fantasy flick. Mitchell Kapner, whose credits include Raimi’s Great and Powerful, The Whole Nine Yards, and Into the Blue 2: The Reef, has been hired to pen a sequel to his film. After Kapner completed his version of Great and Powerful, writer David Lindsay-Abaire (Rabbit Hole, Rise of the Guardians) came on board to rewrite the film. There’s no word from The Hollywood Reporter‘s initial report on whether or not the sequel would follow the same process. RELATED: Dr. Oz The Great And Powerful! While the conclusion of Oz the Great and Powerful sets up for the events of the much-loved 1939 Wizard of Oz, Kapner has wiggle room to continue on with the established characters in his version. The film ends with Oscar utilizing his con man magician skills to convince Theodora and Evanora that he’s been killed, manifesting himself as a talking head with dangerous magical powers. They both flee the scene, escaping unscathed so that they could, theoretically, confront the Wizard at some point down the yellow brick road. Constructing an Oz sequel to fit between Great and Powerful and The Wizard of Oz would be possible, though challenging. Dramatically, we’ve already been given the prelude that connects the two movies. If we saw the further adventures of Oscar (presumed dead), the witches, the Munchkins, and the rest of the gang, the events of Oz 2 would have to loop back around by the end of the film so that everything is in working order for Dorothy’s arrival. Basically, have the same conclusion as movie one. That, or it must have some continuity shift that throws Oz into a J.J. Abrams/Star Trek-style tizzy (a time travel headache that fused “sequel” and “reboot” into one monster of a franchise intsallment). The only way for the original cast to return and create real drama again would be to go off course. Maybe Dorothy doesn’t make it Oz, maybe a house doesn’t fall on the Wicked Witch of the East, and maybe a younger Wizard must come out of hiding to once again battle the evil sisters with some new allies. Diehard Oz-enthusiasts may throw up their hands and scream even louder than they did when Great and Powerful was first announced, but the move would effectively shake up the mythology and split Raimi’s movies into their own dynamic franchise. Attempting to weave another tale into the tapestry of cinematic Oz movies sounds like a messy operation, regardless of how well Great and Powerful plays with audiences. Technically, Oz the Great and Powerful is completely disconnected from the original ’39 movie (that is owned by Warner Bro. while Great and Powerful is a Disney-owned property). Kapner and Lindsay-Abaire culled from author L. Frank Baum’s source material, paying homage to The Wizard of Oz movie as carefully as they could without infringing on WB’s rights. They might be smart to go back to that source material for a sequel: Baum wrote 14 Oz and a handful of spin-offs, telling the tales of various characters and moments in Ozian time. The continued adventures of Raimi’s Oz could flourish if approached like the Narnia series. Instead of following The Wizard and attempt something that continues the plot of the original, find a new lead, a new adventure, and new area of the alternate universe to explore. Audiences may agree with critics that the weakest part of Great and Powerful is Franco. He wouldn’t be needed if the sequel script brought in a new visitor to the world of Oz and wrangled Mila Kunis and Rachel Weisz to return as the pair of Wicked Witches. Anyone who has seen the 1985 cult favorite Return to Oz knows there are a handful of great characters to pull from — Jack the Pumpkinhead, Ozma of Oz, and Tik Tok to name a few. It’s just a matter of weaving them into the light, fluffy world created by Raimi. 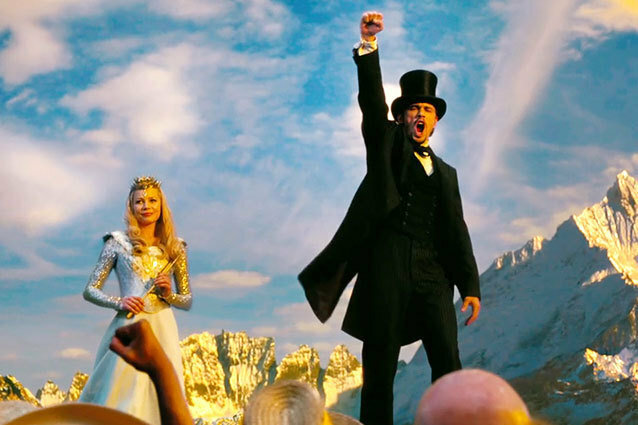 If Oz the Great and Powerful crosses the right box office lines over the weekend, it won’t be too long before Disney shifts Oz 2 into high gear. So what do you want out of a new movie? What can they fix about the first movie? What do they need to keep? Don’t be cowardly — let your brain and heart go crazy in the comments.